The team's first-round pick in 2016, Ifedi is entering what he says he knows is a key season to establish himself in the NFL. Germain Ifedi’s career has been mainly fits and (too many false) starts in his first two years with the Seahawks. Instead of being able to grab a hold of his position for good, there have simply been too many instances of grabbing hold of the defender in front of him. As the Seahawks’ offensive line slogged through the 2017 season, there was no more vexing player than Ifedi, a first-round pick the year prior. As a rookie, he drew raves for his willingness to mix it up with veterans and not back down, a trait seen at the time as adding an element of sorely lacking toughness. But in his second year in the NFL, the Seahawks right tackle stood out mostly like a sore thumb, his NFL-high 20 penalties (16 of which were accepted) the defining image for a line that struggled so much the team fired position coach Tom Cable at the end of the season. Entering year three and with a new position coach in Mike Solari, Ifedi said he understands he may not get many more chances to prove to the team it didn’t make a mistake in taking him with the 31st overall pick. “Yeah, you know, it’s time,’’ said Ifedi, who the team is sticking with as its starting right tackle as it opened training camp this week. “I think it’s time for me to take a step. I’m not going to shy away from it and say it’s just another year. It’s time for me to take that step and to become one of those guys that they talk about like they talk about (teammate and left tackle) Duane Brown. And Ifedi knows step one is cutting down on the penalties. He committed only seven as a rookie in 2016 when he started 13 games at right guard. He was moved to right tackle last season, a position where players are more prone to draw flags. And that Ifedi did, called for nine false starts and eight holds as well as two unnecessary roughness flags and one taunting. Most frustrating were the false starts, the kind of pre-snap penalties that most cause coaches to pull out whatever hair they have left. It’s regarded as simply a basic mistake by a player. In a sign of what coaches might call increasing maturity, Ifedi said he doesn’t disagree with Cable’s assessment. In an attempt to fix the issue, Ifedi said he has reviewed each of his penalties multiple times to figure out what not to do next time. If there’s a lesson, he said it’s a need to pay better attention to the basics of his position, stating candidly that a few times he just was confused about snap counts. “It’s just focusing in, honing in on the details,’’ Ifedi said. As an example, Ifedi cites the game against the Giants in New York when he got called for two false starts in the first half. Ifedi said the issue was that the Seahawks changed from a silent snap count to an audible one. 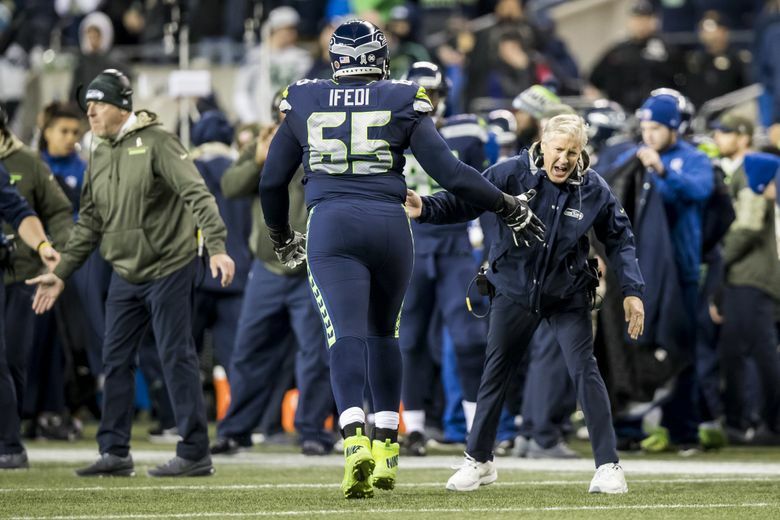 Seahawks coach Pete Carroll said Friday the team has made it clear Ifedi can’t have similar lapses this season. While Ifedi has become a lightning rod of criticism for Seahawks fans, the team has made it clear Ifedi remains its right tackle. The backup at the moment is Isaiah Battle, who has never played in a game in three seasons bouncing around NFL rosters. Along with added maturity and maybe a greater sense of urgency from Ifedi, what the team also hopes makes a difference is the addition of Solari. Solari will vary the team’s scheme, adding more man blocking to the zone packages the team favored under Cable, which may be a better fit for Ifedi’s style of play. Ifedi said he likes the additions Solari is making to the team’s scheme, though he said he takes some objection to the idea he can’t be as effective doing whatever the team might ask. Ifedi also thinks playing alongside Brown for a year will also make a difference. Ifedi grew up in Houston idolizing Brown, who played for the Texans before being traded to Seattle last October, and the two have been workout partners through the years. But Ifedi says he understands the time for talking is over.